Google Messenger :- material makeover to sms app that's it ! So with all of the wonky busy makeup of all Google's apps to so called " material design ",this month must be pretty boring for google engineers revamping,redesigning their apps to match the new Android's Lollipop Design language.Hence with Google play store update to play book,play movies,play music,google calender,gmail,google camera,play newstand,photos app.. whosssh Google's doing a pretty great job taking its lollipop update to a whole new level.. and to let it support to a vast majority of android users with the added time frame to wait for it.! Meh...!! And that's why you can see people blaming google all over the internet Since november 3rd till the date for not receiving the latest update on their nexuses or Google play edition phones.But you all gotta understand as this is the biggest update in android history Revamping from its Api's,fluidity,functionality just as like in considered to Ios 6 To Ios7 upgrade(major redesign to IOS),so you got to understand that frame same here in case of android. So anyways lets talk about a new material design app adding polish sms functionality in Android Lollipop update called as "Google Messenger ".. ahhh not any fancy stuff just a updated a more polish look been given to the sms app.. I am still confused whether what will happen to hangouts now ? 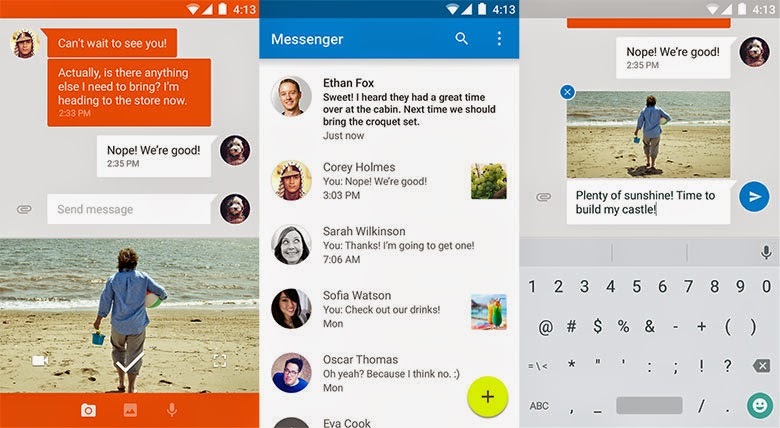 Messenger from Google is a communications app that helps you send and receive SMS and MMS messages to any phone. You can also send group texts as well as your favorite pictures, videos and even audio messages to your contacts. So it looks like as Hangouts replaced Sms app in Android Kitkat , Messenger app would be the same concern in Android lollipop replacing Default sms app with Google Messenger.